CLOSED! Thank you to everyone who participated and congratulations to our winner: Raul Bautista! Welcome to Vitamin String Quartet’s Twilight Reboot. Each day this week we’re asking fans of the Twilight saga to reimagine the series by recasting the main characters and selecting new music for the films. Each time you share your picks, you earn the chance to win a VSQ tribute to an artist who’s appeared on a Twilight soundtrack. Today's your last chance to win! Answer: What 10 songs would be on your ultimate Twilight soundtrack? 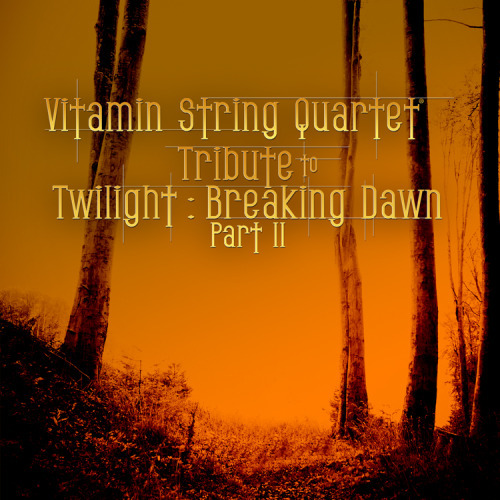 Today's winner will receive the following albums: Strung Out On Paramore, String Quartet Tribute to Muse, Vitamin String Quartet Performs Radiohead's In Rainbows, and Vitamin String Quartet Performs Linkin Park's Minutes to Midnight and a full download of Vitamin String Quaret Tribute to Twilight: Breaking Dawn Part 2, which is slated to release November 20th. Leave your soundtrack's songlist in a comment below (don't forget to include your email address so we can get in contact with you if you've won!). Entries close at 10:00 pm PST.